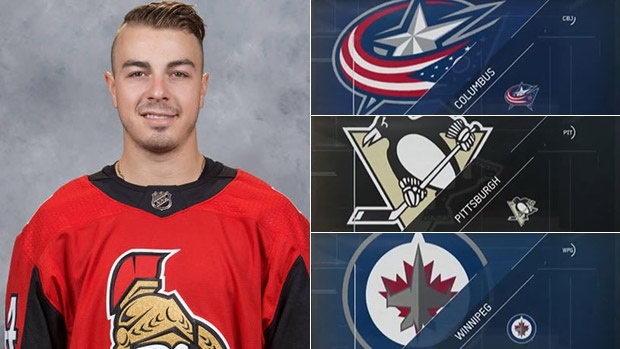 Today, we examine potential new homes for Ottawa Senators centre Jean-Gabriel Pageau. Columbus Blue Jackets: The Blue Jackets have been fading, but they’re in the market for experienced depth at centre. Outside of Brandon Dubinsky, no skater in Columbus’ lineup has won a single playoff series. Pageau was a part of three series wins last spring alone - and the Blue Jackets have the young pieces to make for an interesting return. Pittsburgh Penguins: GM Jim Rutherford has been on the prowl for a dependable third line centre to fall under Sidney Crosby and Evgeni Malkin. What he’d get in Pageau, unlike some of the other less expensive players on the market, is a centre who can help drive play. Pageau’s big-game playoff experience - coming off an eight-goal campaign last spring - is just an added bonus for a team gunning for a third straight Stanley Cup. Winnipeg Jets: It all depends on what the Jets decide they value most: a centre or a winger? When Mark Scheifele returns, will Blake Wheeler slide back to the right side or remain at centre? If Wheeler goes back to right wing, the Jets would be pretty solid competing against the likes of Nashville and St. Louis with a trio of centres like Scheifele, Bryan Little and Pageau. Where will Jean-Gabriel Pageau go?